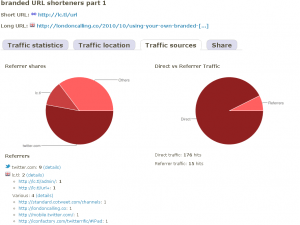 This post follows on from part 1 where I introduced the concept of short URL services and how some companies and individuals have started to deploy customised URL shorteners. So now you’ve made the decision that you want your own short URL service (like the one I use, lc.tl) – what next? Well first of all you need to secure a domain. [top tip] When you use their search engine, tick all the region boxes and then when it has run through all of the options, click the “toggle taken domains” to see which ones are left. Gandi.net are not the only registrar in the game – others you can try include eurodns or domai.nr and these companies offer a wide range of domain extensions. From my experience if you want a 2 letter domain then your options become pretty limited. Once you have the domain registered, you have a couple of choices. I chose the second route as I have full control and unlimited domains with my webhost webhostingbuzz.com. If you don’t have access to your website (most likely you are a company than a blogger) to host the service yourself then you can use one of a number of services. 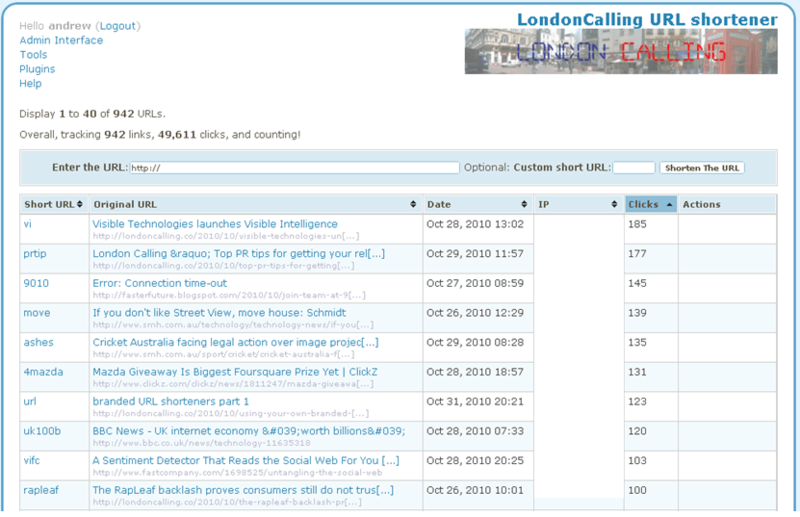 Many of the bloggers in my list of short URL users in part 1 are using the free bitly.pro service. It extends the functionality of the bit.ly service by using your domain instead of theirs BUT you are still forced to use the global bit.ly hashes (the characters that come after bit.ly/). If you choose to keep the bit.ly generated links then you end up with URL spaghetti like http://bit.ly/cnryPe, or you might even fluke a rude url link like Stephen Fry did some months ago. The self-hosted option also has merits for individuals and brands, because you are not at risk of the service closing down and you can use whatever short URL extension you want. For example, I promoted part 1 of this article using the link http://lc.tl/url on twitter. The /url link is something I chose and have full control over as I am using an open-source an excellent open source URL shortener from Ozh Richard (@ozh) called Yourls. It does just about everything that bit.ly and the $999 version of bit.ly pro does and all it cost me was a domain name and some space on my server. Now with yourls I also have a comprehensive admin page to create, modify and search short links I have created (click to see larger view). 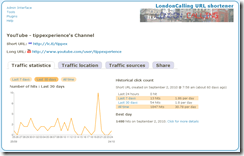 Below are the statistics from one single tweet of the now famous Tippex Youtube video. 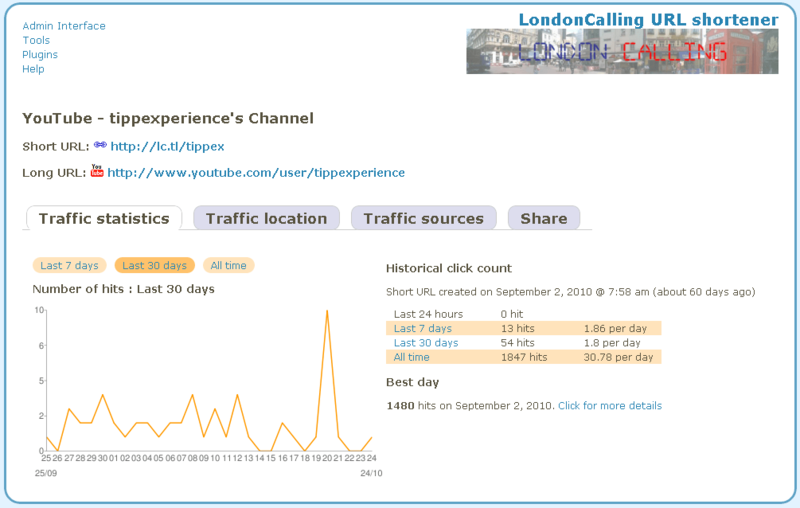 I tweeted the link http://lc.tl/tippex and you can see the results on http://lc.tl/tippex+ (adding the + to see the stats just like in bit.ly). 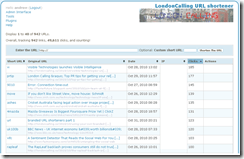 You also have the option to look at referring domains/countries etc – just like bit.ly. Click on the images below for a larger view. [top tip] Use backtweets.com to see where your unique links are being shared. I have an email sent to me when any of my links are shared on twitter. Because lc.tl is unique, I know it is one of my links that is being tweeted. 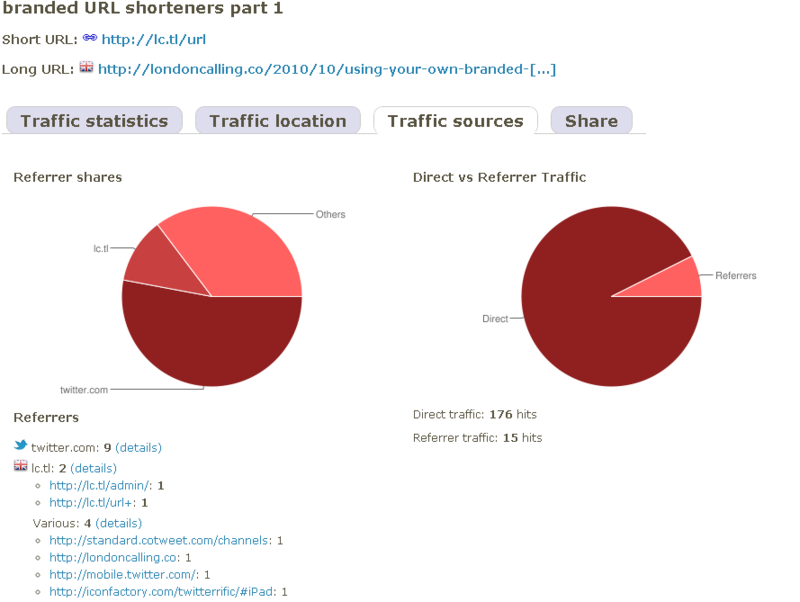 So if you are a brand or a blogger, you can easily set up and maintain your own URL shortener, and retain your branding, while also keeping control of all the links you create. Andrew. Came across another. all.bm. From Bermuda where I used to work. I can’t praise this article enough. It is great all around. However, for the purpose of sharing on twitter only, what about a mention about their new t.co url shortener? Alex, thanks for your kind feedback. With respect to t.co, this twitter run shortener falls into the bit.ly camp in that it is twitter’s brand being promoted and not your own. The effect is the same, but twitter also do NOT currently even provide simple access to the stats from t.co redirects so why would I uses something inferior?